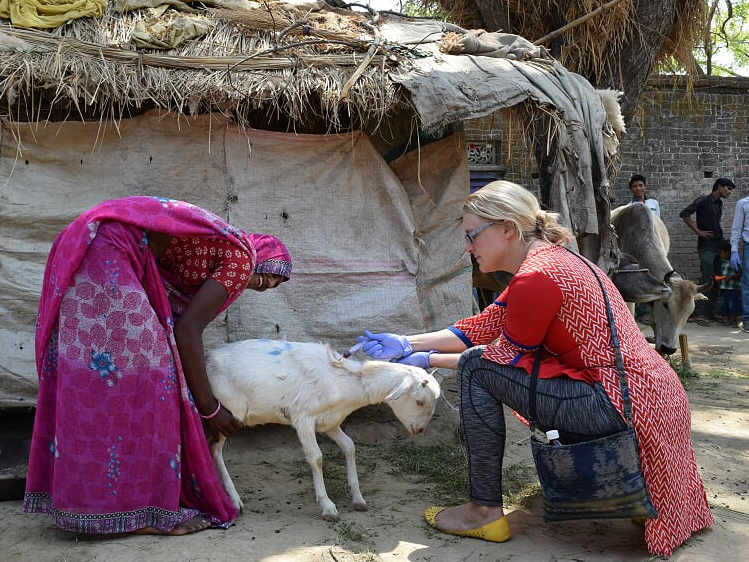 We provide veterinary care to dairy animals in India's poorest villages. So they produce more milk and income for the women who own them. Meet the women we work with. Take small steps to make their lives better. We are a small group of animal vets and volunteers. We work in a few of the poorest Dalit (“Untouchable”) villages in Uttar Pradesh, India. Join with us. Our work is simple. In these villages, women and families depend wholly on their dairy cattle – cows, buffalo, and goats – for health and life. Dairy cattle produce the only protein for village children. If their animals produce more milk, village women are free to use the extra income to send their kids to school or improve their lives in other ways. But the need is very great. The vast majority of village animals suffer from parasites and disease that reduce milk production, limit growth and healthy birthing, and threaten the health of women and children. We provide veterinary care for these animals. They produce more milk and offspring. Children are healthier. And women are empowered with income of their own. We are One Small Village. Join with us. If you can’t travel to the villages with us, you can join our small village of Mere Saathi Partners who sustain this work. Or you can make a one-time donation of just $10 to treat three dairy cows for one year. Then share your message with family and friends who will join you in Mere Saathi’s work.